The Anchorage Alaska Visitors & Travel Guide highlights what you need to know before you arrive from reserving your hotel to locating some favorite Alaska attractions. Also includes Anchorage Alaska tours, hotels and rental cars and vacation planning advise. Check out the new Alaska Vacation Planner. ~ Where is Alaska? Anchorage is our passion, and we know it will be yours. 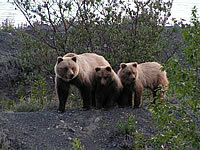 Here at AlaskaAnchorage.net, you can read Anchorage related articles, browse Anchorage visitors guides and read past visitors reviews, reserve hotels online, find stock photographs, locate a taxi cab, or sign up for an Anchorage business account to promote your own Alaskan business and/or services. I can't afford to go to Alaska every year so this website is a dream. The pictures, the stories, they are all so magnificent and they make me feel like I'm back up there. I've been to Alaska 4 times in the past 12 years and it never fails to charm me with its beauty, and solitude. This website has helped me relive these trips and now I am planning my 5th trip with the advice, advertisements and recommendations offered here. Friends at the front door, Wilderness at the back! Anchorage Alaska welcomes you to a city where the wilderness is never more than one step away. Anchorage is a city where the great outdoors is more then just a way of life, or where the wildlife roams free throughout the immense expanses of greenbelts in our grand city, but more of a way of life, free from the typical constrains found in most metro areas. Explore such icons as Mount McKinley, Lake Hood, the Chugach Mountains, and the Anchorage coastal trail. Be sure to see the many micro breweries, thriving arts scene, the great ski areas, and the world renowned agricultural region in the Matanuska Valley where the vegetables grow as big as our salmon, it's no wonder Anchorage Alaska draws so many visitors back to the state again and again. If you're curious, check out Where is Alaska for some fun facts about this great state. Experience our little piece of Alaska with an up-close and personal experience that begins upon your arrival and goes home with you in your memories. Everyone who comes to Anchorage finds something special to them. Whether it be the abundant wildlife that roams our streets, a salmon bake in a downtown restaurant, a nature walk in one of the many greenbelts or just the laid back culture of a truly unique frontier town. You will surely bask in the experiences of Anchorage's natural splendor long after your vacation is over. What is Anchorage AK like today? Anchorage is the home to more than half of the population of Alaska. Anchorage is known as both the "City of Lights" (winter) and the "City of Flowers" (summer). The current populations is 278,700 as of the latest census figures. The city possesses all the cultural amenities and activities one would expect from any urban center, but this one just happens to be surrounded by an awesome wilderness of mountains and valleys, glaciers and fjords, active and inactive volcanoes. At first mention, Anchorage may stir up visions of igloos and Eskimos, but Alaska's largest city is nothing like that at all. Much warmer than you may think, in the summer Anchorage sees an average temperature around 68° which is ideal for partaking in the area's outstanding recreational activities. Here you can enjoy a day of hiking the many mountain trails, riding bikes the many greenbelt parks, salmon fishing in ship creek or panning for gold at Crow Creek Mine south of town. You can explore portage glacier, cruise Prince William Sound, or take a dinner cruise in Kenai Fjords. If glaciers are on the agenda, don’t pass up on Whittier and the 26 Glacier Cruise in the Princes William Sound. If these Alaska Vacation Ideas sound good, what tell you read about the many Anchorage tours that provide an incredible one-day cruise opportunity from Anchorage via Whittier, Alaska. Experience the stunning scenery and abundant wildlife that make Alaska's magnificent Prince William Sound a remarkable Alaska travel destination. Like most all metropolitan cities, there is a wide variety of transportation options within Anchorage that includes taxis and limousines, rental cars, Recreational Vehicles, bicycles, motorcycles, motorcoach charters, and Anchorage public bus service. Many lodging and visitors attractions outside the downtown Anchorage area cater to visitors by offering free shuttles during the summer. Watch for this as you visit the web site's of the corresponding Anchorage hotel and motels through-out this site. Things To Do In Anchorage AK. Anchorage Alaska Fishing 2015 Alaska salmon fishing season is looking to be a pretty good year for local fishing in the rivers, streams and lakes around the municipality. NASA has predicted that 2015 will be the best year to view the Northern Lights since 1958. If you’re interested in building your next itinerary around a local festival or event, or if you’re looking for something new and unique to add to your itinerary, read through the exciting topics we have included in this site for 2010. for more read Things to do near Anchorage Alaska, Things to do north of Anchorage and Places to go south of town for our take on our favorite places to visit around Anchorage AK. Looking at some of our favorite things to do as well as places to see in the local area, we have to include a trip to see Lake Hood, the worlds largest seaplane base. Anchorage salmon fishing in Ship Creek is an excellent family activity, so grab your rods, your kids and your cameras and head on down to the creek for some excellent urban salmon fishing in the heart of our city. There is also a wealth of fishing opportunities available within a days drive of Anchorage for everything from Halibut and Salmon to trophy Rainbow Trout and Grayling. Many of these areas are offering great packages on Alaska fishing for 2015. See Anchorage Alaska Halibut Fishing and Where to catch Salmon near Anchorage. Visitors are welcome to enjoy the Anchorage Fishing Tours available in the area. Take a trip from Anchorage to Whittier along the Seward highway and Turnagain Arm. Shuttle services for Anchorage to Whittier start around $35.00 per person. It’s a great deal for those not renting a car in Anchorage or taking the train to Whittier from Anchorage AK. Anchorage shuttle and tour services includes private charters, day tours to Seward, Denali National Park tours, bus charter, Anchorage to Whittier shuttles, Anchorage to Seward shuttle, cruise ship transportation, limousine services, buses & taxi cabs, and cruise ship transfers in Anchorage, Seward and Whittier. Prepare to enjoy the rich flavor of fresh Alaskan salmon served in the restaurants around town. Anchorage is full of great restaurants that specialize in Alaska cuisine. The Hotels and Lodging in Alaska pages will help you find your perfect place to stay during your travels in Alaska. Locate a hotel in Anchorage Alaska from the multitude of lodging available in the Anchorage Municipality. Find all the HOT DEALS on Anchorage Hotels before you open that checkbook, or the Anchorage Pet Friendly Hotel near to your destination. Let's take a look at what all is available in hotels from areas to services. Read Anchorage AK Hotel for a summery on all that is available within our first class city and the surrounding area. Anchorage Hotels can be booked through Priceline.com at significant savings. Average rates when booked through this service average around 25 percent below the standard hotel rates. The hotels listed offer superior pricing and represent a significant savings for Alaska business or vacation travelers. Stretch your vacation budget at these fine places to stay. Fishing in and around the city of Anchorage Alaska consists of excellent bank fishing in Jewel lake to some very good salmon fishing in the rivers and steams of the Anchorage area. Anchorage is not just the jumping off point for sportsmen it can also be a destination onto itself. Car and RV Rental in Anchorage AK. Yes, there are car rentals available throughout Anchorage from all the top rental car agencies in Alaska. Anchorage Airport car rentals located at Ted Stevens Airport to RV rentals of all sorts can be located here in the metropolis city of Anchorage. So if you find yourself in the need for an Anchorage Car Rental or Car for Hire there are services from the leading car rental services for all available car types and styles in town. Drive a Lincoln town car, Toyota Tundra or how about renting a H2 or H3 Hummer? Hey, this is Alaska you know. There are conversion van rentals, motorhome rentals, car and truck rentals, basically, if you need a car while in Anchorage, you can find it here. Anchorage offers four distinct seasons that each offers something special for those living in this great land as well as everyone that comes up for a visit. Each season offers a special gift of activities that are dependant upon the average temperatures in Anchorage AK. Everyone knows Anchorage is a fun place in the summer, but winters hold a special allure often not realized by those not visiting in the winter months. Winter activities include stargazing through the northern lights, attending one of the dog sledding events or ice carving classics held each year, skiing at one of the three ski areas in the Anchorage Metro area or ice fishing on a local lake. From the first flowers of a sub-arctic spring to the extravagant array of falls crimson colors, Anchorage is a Mecca of stunning beauty passionately pleading to be discovered. Getting around in Anchorage Alaska! Read about those little things that you need to know before you arrive in Anchorage from locating a hotel to renting a car. 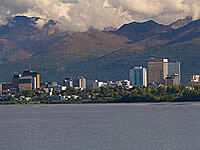 Learn about Anchorage AK, view our photo gallery of Anchorage and the local vicinity and much more. This new site is being brought to you to address the need for an all inclusive Alaska Anchorage visitors guide. New areas being covered for 2010 will include Anchorage Inn and Motor Inn's, Airport Shuttle services, Car Dealers, Money saving Alaska Vacation Ideas and Alaska Wildlife Tours. The Anchorage cruise terminal is located at the Port of Anchorage is where Holland America docks in Anchorage. The rest of the cruise lines actually use the ports in Seward and Whittier. Only Holland America uses the Anchorage Cruise Terminal. © 2002-2015 Anchorage Marketing Group, LLC. All rights reserved.